The industry leading Real Time Streaming Analytics platform has arrived – Customer General Availability– April 28th. Last year we released V1, Oracle Stream Explorer, with its new approach to providing customer streaming solutions in minutes rather than months, exploded adoption of the platform with deal sizes growing to the millions $$$. 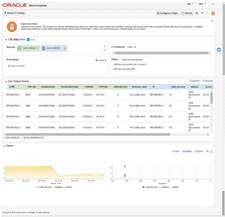 2016 now reveals a massively enhanced platform which according to the analysts and customers changes the game to place Oracle as the industry leader. OSA for Sales: How to sell, why sell across all industries, domains and enhancing other compelling Oracle offerings, Big Data (Fast Data), Data Integration, IOT. Addressing the demand for FOG, on premise, hybrid and cloud services. OSA for Technical: Basic foundational, intermediate and advanced hands-on intensive labs including – Visual GEOProcessing, our revolutionary new Streaming Predictive Machine Learning, Streaming Business Rules, Expression Builder, Topology viewer, Connection and Target profiling, Coherence and extended Event source/sink streaming end-points such as Kafka, MQTT. How to use the new integrated Spark Streaming infrastructure, Cloud enablement, Services, now and arriving this year. LIMITED SPACE – Send an email to register and reserve a seat.